Velocity, in case you haven’t fallen asleep to auction coverage lately, is Discovery’s car-centric channel. While it’s more known for winga-dinga build shows than motorsports, that’s about to change. The entire World Endurance Championship will be broadcast on Velocity and MotorTrend.com. Notably, the entire 24 Hours of Le Mans and the new 1000 Miles of Sebring will be broadcast on a single television channel: Velocity. Practice and qualifying for Le Mans will be on MotorTrend.com or the Motor Trend app. Velocity will rebrand itself as the Motor Trend Network this fall, according to Deadline Hollywood, which makes MotorTrend.com streaming service sort of like Velocity’s new version of ESPN3 or Fox Sports Go. However, currently MotorTrend.com is a separate $4.99/month subscription that isn’t included with your cable package, per a network representative who spoke with Jalopnik. Velocity’s name change was announced shortly after Motor Trend moved all of its new full-length videos from Motor Trend and its related sites to their in-house MotorTrend.com streaming service and off of free to watch platforms like YouTube. Unfortunately for fans of the American-market broadcast team, Velocity and MotorTrend.com won’t have their own dedicated staff of pit lane reporters and commentators, Racer notes. Instead, they’re rebroadcasting the feed from Eurosport, including Eurosport’s full commentary. Perhaps the best part of this news, however, is the soon-to-be Motor Trend channels are focused on cars, just as the much-missed Speed network used to be. Therefore, there’s a far smaller chance that a car channel would push Le Mans off TV to run prerecorded studio shows and golf highlights in its spot. 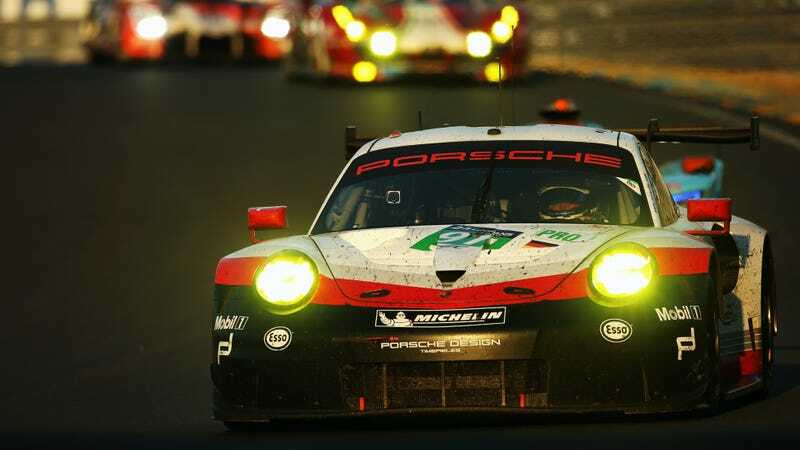 Just as with Formula One on ESPN’s networks, you’ll have to do some streaming to watch every hour of every WEC session, but even the non-Sebring and Le Mans races have the first and last hours on TV. While the WEC already offers their own commercial-free streaming package directly to viewers that’s really good, this new TV deal certainly makes the idea of paying for new episodes of Roadkill on MotorTrend.com sting a bit less. UPDATE [4/19]: Unfortunately, this isn’t as much of an upgrade as initially thought for those of us used to streaming races through the WEC’s own web page and app. A WEC representative confirmed that live sessions on the WEC’s own live streaming service would be geoblocked in the United States as part of this new television and streaming package. So, in order to watch the whole season, fans in the United States will need to have cable—as Le Mans is only shown on Velocity—as well as the Motor Trend app. This is a massive downgrade from being able to just go to one website and stream the entire season, and quite frankly, inexcusable in light of F1 being able to develop their own in-house stream without geoblocking the U.S. when ESPN is broadcasting the same sessions. UPDATE [4/24]: The WEC confirmed today that the geoblock will extend to Canada (exception: Québec), as they are also served by Velocity. If you already paid for the season through the app and live in the areas in which they’re geoblocking their own app next year, you can submit for a refund either through Apple or at web@fiawec.com. If the idea of needing to pay more to have both cable and MotorTrend.com access just to watch one season isn’t frustrating enough, some fans are reporting that they don’t even get Velocity but will be in the geoblock anyway. Judging by the reactions to this news, I do not envy the person manning that WEC address.